Pz.Kpfw. 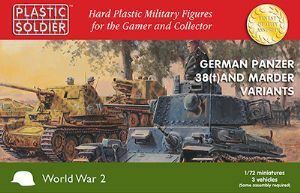 38(T) and Marder options.Each sprue has options to also build a Marder SdKfz 139 or Marder SdKfz 138 Ausf H self propelled tank destroyer and there are 3 separate crew sprues each comprising 10 various crew figures. 3 models in a box and 30 crew figures. rrp £16.95.